All You Need To Know About Organ Transplant. Organ Transplant is a process of picking an organ from one individual and placing it in a different individual, such as a kidney transplant. It is generally carried out to replace a diseased organ with a healthy one. The organ transplant may sometimes lead to various complications in the individual receiving that organ. These complications are mediated through host body immune responses against antigens of the transplanted organ. Antigens of the transplanted organ are those antigens that are present on the cell surface or on the organ surface. These antigens are responsible for graft rejection or acceptance. These antigens induce the immune response in the host that may cause the rejection of the transplanted tissue. The Major Histocompatibility Complex (MHC) antigens are the major barriers to transplantation of an organ. MHC antigens are surface molecules that direct T-cells to carry rapid graft rejection. 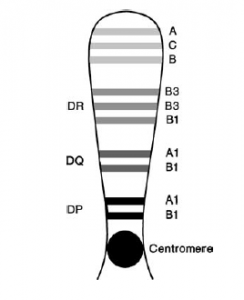 These antigens are also termed as Human Leukocyte Antigen or HLA Complex in Humans and the gene coding for the molecules are present on Human Chromosome 6. Rejection of the graft or a transplanted organ by the recipient is called as the Graft Rejection. Graft rejection is mediated by both cell-mediated (T cell) and humoral-mediated (antibodies). Our immune system treats mismatched transplants in the same way as microbes. Therefore, if a patient rejects first organ transplant through antigens, it will reject a second transplant carrying the same or shared antigens much faster. This type of rejection is known as “second set response”. Hyperacute rejection occurs within minutes or hours of organ transplant. It is believed to be mediated by pre-existing host serum antibodies specific for antigens of the organs and has the greatest impact in highly vascularized organs (such as kidney transplant and heart transplant). This rejection may finally lead to inflammatory reactions, which causes endothelial damage and blood clot formation within the capillaries, preventing vascularization of the organ. Acute rejection occurs within the first weeks or months following the organ transplant. It is mediated by effector T-cells, besides this macrophage activation and antibodies also play a role. Moreover, this rejection is characterized by severe infiltration of the organ by activated lymphocytes and monocytes. Chronic rejection is a slow process and develops months or years after the graft transplantation. The mechanism of rejection includes both humoral and cell-mediated responses by the host. Can we match organs before an organ transplant? Tissue typing is the commonly used method for matching donor and recipient before an organ transplant. In this method, the HLA antigens of class I type on leukocytes are identified by means of antisera obtained from persons who have received multiple blood transfusions and from volunteers who have been immunized with cells having different HLA haplotype. Lymphocytes are incubated with a panel of standard sera for HLA antigens (Class I MHC antigens) in the presence of complement. Cells carrying antigens corresponding to the HLA antiserum are killed, which are then detected by the addition of trypan blue (stain only dead cells). This method is used to determine MHC Class II antigens. Lymphocytes from the donor are irradiated or treated with mitomycin C to prevent cell division and then added to cells from the recipient. If the class II antigens on the two cells populations are different, the recipient cells will divide rapidly and take up large quantities of radioactive nucleotides into the newly synthesized nuclear DNA. The amount of radioactive nucleotide can be measured easily. How can we prevent Graft Rejection during an organ transplant? 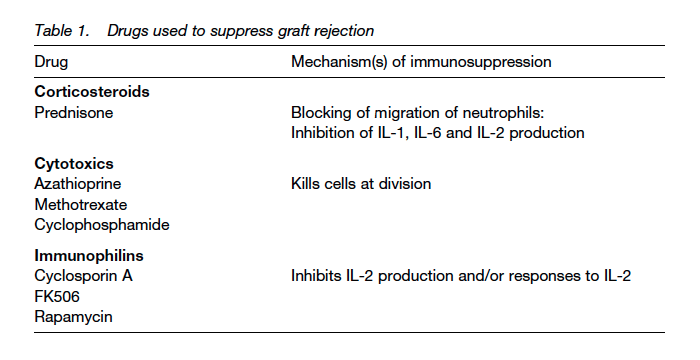 The immune system of the recipient has to be suppressed to avoid graft rejection. Irradiation, corticosteroids and Anti-Lymphocytic Serum (ALS) are employed for immunosuppression in clinical transplantation. However, some synthetic cytotoxic drugs and some fungal metabolites such as Cyclosporin A and Rapamycin are also used. These are certain privileged sites where organs or tissues are permitted to survive. These include the anterior chamber of the eye, cornea, uterus, testis, and brain. Each of these sites is characterized by an absence of lymphatic vessels and sometimes also blood vessels, that means these are areas without significant immune access. Corneal transplantation is the best example of transplantation at such sites. Previous PostWho discovered that DNA is the Genetic Material?Next PostWhy Nature Preferred DNA over RNA? I would lime to know if there is ever a known maximum lifespan for a person who has received a transplanted organ. I know things may vary from type of organ and the how is the rejection quotient work on the transplanted body. But is there already any known statistics for it? Kidney: it is the most commonly transplanted organ and its procedures have been worked out in detail. Thus, an average kidney transplant lasts 5 to 8 years. 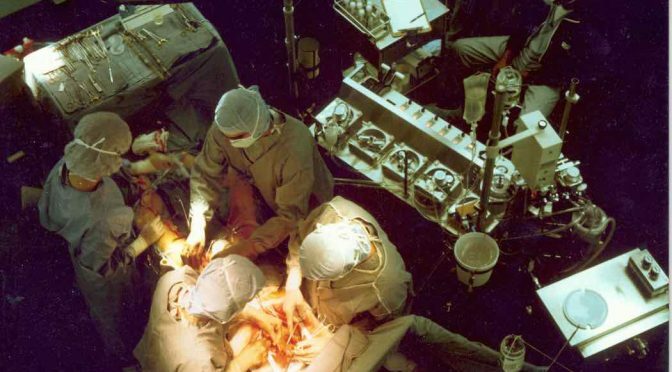 Heart: The one-year survival rate for the heart transplant is more than 80%. Lung: First-year survival rate for lung transplants is reported at about 60%. Liver: One-year survival rate is approximately 65%. Pancreas: One-year success rate for pancreas transplantation of 55% have been reported.